But this scene, in addition to introducing the characters, serves as a starting point for the restaurant’s troubles. They have been in business for two years, but are not a popular eating destination for the general public. They have fallen behind on their loan payments and are struggling to make ends meet. But this is not the concern of Primo; Secundo is left to deal with the practical considerations of running a business. There is a rival restaurant across the street. The owner, Pascal (Ian Holm), is a shifty and profane character. But he has befriended the newest Italians on the block and offers to help out. He will invite a famous jazz-player friend of his to a dinner party at Primo and Secundo’s place. Word of mouth will spread and their business will be a hit. Secundo realizes this is their last chance for salvation. A few other characters flesh out the story. Secundo has a girlfriend, an American named Phyllis (Minnie Driver). They are serious but he wants to wait until the right time; that is, when he is financially secure. Another woman, Pascal’s girl, complicates matters. Gabriella (Isabella Rossellini, looking the spitting image of her mother with a short haircut) serves as the pretty woman of Pascal’s restaurant. She is also involved, in some capacity, with Secundo. A final woman, in a more innocent relationship, is shyly courted by a nervous Primo. Ann (Juno’s [review here] Allison Janney) is the local florist. Her relationship with Primo unfolds gradually and gently. Much of the movie, in fact, unfolds gently and gradually. It doesn’t mind lingering on the quiet moments. There are many long takes, the camera gently observing some of the more mundane moments of the restaurateurs’ lives. The opening shot, in fact, follows their helper (a young and dweebie-looking Marc Anthony) as he finishes up a smoke break and joins the brothers in the kitchen. The final shot, too, lingers on a quiet breakfast scene. Little is spoken but much is conveyed. Some people will appreciate Big Night for this style. It allows the characters to develop as they take priority over any plot or story. Others will be uninterested in such a slow film. With little happening at any given moment it takes some patience and endurance to follow the nuances to the end of the film. Similarly, some audiences might find the ending perfectly fitting and appropriate, while others might not find it credible or significant. I would lie somewhere in between. The pace didn’t bother me; the methodical movement of the story fits the characters. I didn’t find the ending entirely convincing, though there aren’t any glaring faults. 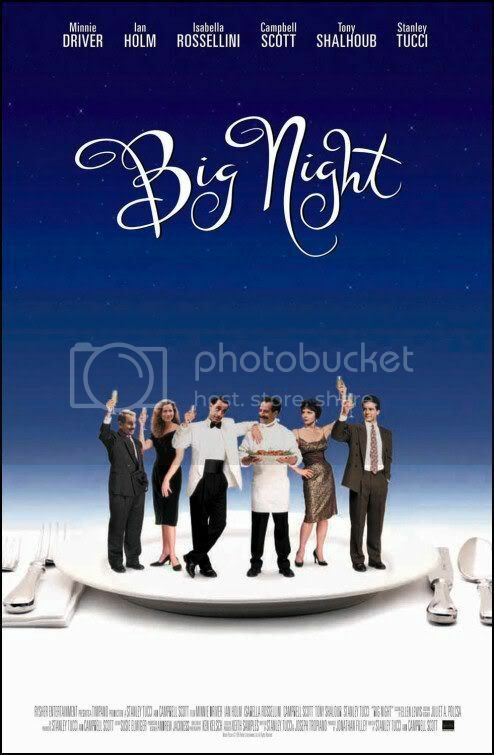 Some might point to Big Night as a ode to the love of food, in a similar manner to films like Babette’s Feast or The Cook the Thief His Wife & Her Lover. 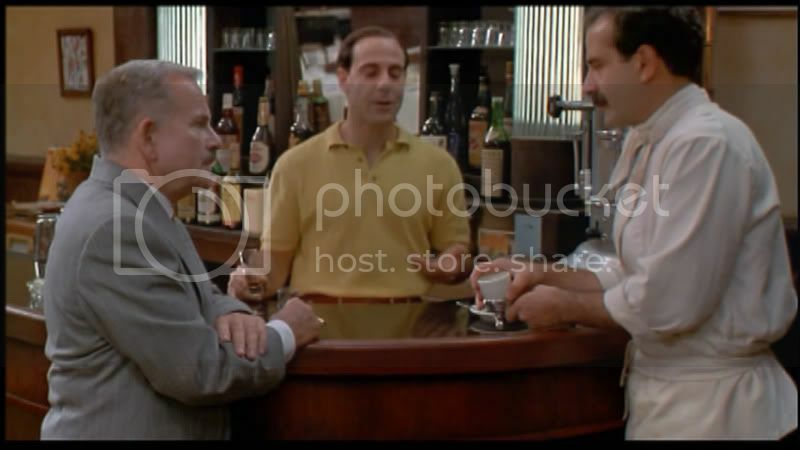 While the opening scene and the extended dinner party offer moments that delight in fine Italian cuisine, I found the focus to be on the two brothers and their respective personalities. There are few moments when the camera lovingly caresses Primo’s creations, though one of them involving an apparently fictitious dish called timpano is memorable. There is much to be enjoyed in the film, for those patient enough to pay attention, but a great love of cuisine is not one of the most apparent. Instead enjoy the clashing personalities of these disparate brothers as they attempt to impress upon cultureless Americans an appreciation for the finer foods in life.